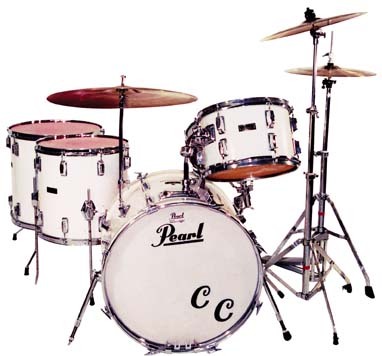 The drumset that Cozy Cole performed on in the last years of his illustrious career is a fiberglass Pearl kit with a 16 x 20 bass drumThe lowest pitched drum in a marching band or with a drum set. A two-headed drum, it is usually..., 8 x 12 rackA metal assembly that surrounds the drum set and holds the top parts of cymbal stands as well a... tom, 14 x 14 and 16 x 16 floor toms, and a 5 x 14 metal-shell snare drumOne of the more common drums in marching bands and drumlines and the primary drum of a drum set.... The bass drum pedalThe pedal used to play the bass drum on a drum set. 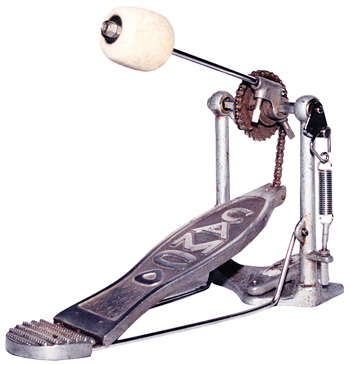 is a Camco, which was one of the original pedals that Al Duffy fitted with a piece of chain when he worked at Frank Ippolito’s Professional Percussion Center in New York City, thereby inventing the chain-drive bass drumA hollow cylindrical shell of any size that has a head stretched over one or both ends and is b... pedal. 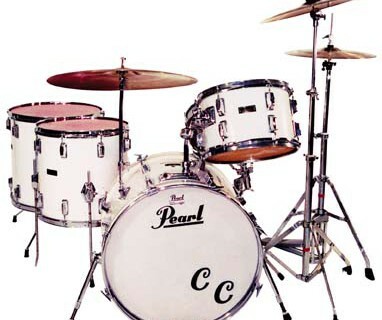 (Duffy was awarded a patent for his design, which he later sold to Drum Workshop.) The kit also includes a Pearl hi-hatA piece of the drum set, consisting of two cymbals mounted on a stand. The cymbals are opened a... pedal, a Rogers cymbalA copper/bronze (or variation of metal alloy) disk struck with a drumstick or crashed together ... stand, and a snare drum stand and cymbal stand of unknown origin. (The Zildjian cymbals displayed with the kit were not part of the original drumset.) Cozy Cole (1906-1981) achieved his greatest fame with the drum feature “Topsy,” which was a hit in 1958. As a drummer, he worked with such leaders as Jelly Roll Morton, Benny Carter, Stuff Smith, Cab Calloway, Louis Armstrong, and Jonah Jones, and was also active in recording studios and theater pits. He attended the Juilliard School in the 1940s, and in the 1950s he and Gene Krupa operated a drumming school in New York.